The cloud computing infrastructure built on servers with different levels of virtualization technologies and consists of reliable services delivered through data centers. These services are accessible anywhere that provides access to networking infrastructure. Public clouds are mostly hosted away from customer premises. These clouds are access by third parties and applications are mixed together from different customers on the networks and storage systems, cloud’s servers. They help to reduce cost and customer risk by providing a flexible extension to enterprise infrastructure. The existence of other applications that are running in the cloud should be transparent to both end users and cloud architects, if a public cloud is implemented with data locality, security and performance in mind. Private clouds are providing the control over quality of service, security and data, built for the use of one client. These clouds may be deployed in an enterprise datacenter and may also be deployed at a collocation facility. Private clouds can be managed and built by a cloud provider or by a company’s own IT organization. In the “hosted private” model, a company can operate, configure and install the infrastructure to support a private cloud within a company’s enterprise data center. The model gives companies a high level of control over the use of cloud resources. 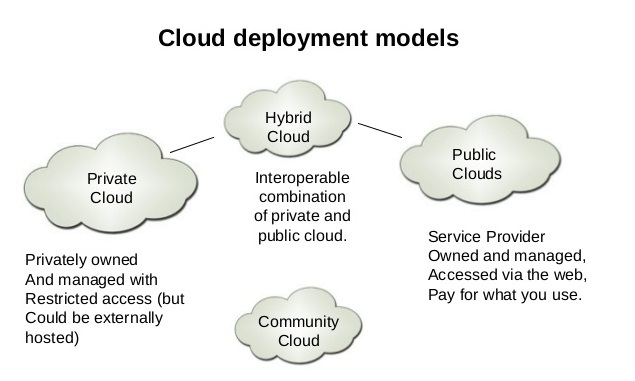 Hybrid clouds are a combination of both public and private cloud models. They help to provide on-demand, externally provisioned scale. A private cloud with the resources of a public cloud can be used to maintain service levels in the rapid workload fluctuations. A hybrid cloud also can be used to handle planned workload spikes. It is also called “surge computing,” a public cloud can be used to perform tasks that can be deployed easily on a public cloud. Hybrid clouds determine how to distribute applications across both a private and public cloud. If the application is stateless or the data is small, a hybrid cloud can be much more successful than if large amounts of data transferred into a public cloud for a small amount of processing. So, these are the basic service models and rest of the models we will discuss later.